This publication sets out the essential information necessary to prevent asphyxiation incidents involving inert gases. It is not a detailed procedure for confined space entry, but focuses on the considerations that are important when there is an actual or potential hazard from inert gases or oxygen deficiency. This publication is intended for supervisors, line managers, direct workers and users wherever inert gases are produced, stored, used, or where oxygen depletion could otherwise occur. Appendix A is a simplified summary of the main publication. Appendix B lists some actual incidents that have taken place in recent years and may be used as examples to underline the potentially fatal hazards of inert gases. Other hazards exist with oxygen-enriched atmospheres greater than 23.5% oxygen. 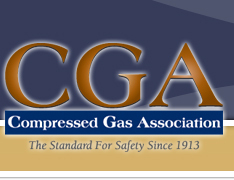 When presented with an oxygen-enriched atmosphere, see CGA P-45, Fire Hazards of Oxygen and Oxygen-Enriched Atmospheres, for more information. Although carbon dioxide is not an inert gas, most of the information in this publication is applicable as it too will cause oxygen depletion. This publication does not cover the specific hazards and physiological effects of carbon dioxide, see CGA G-6, Carbon Dioxide, for more details about the additional hazards of carbon dioxide.